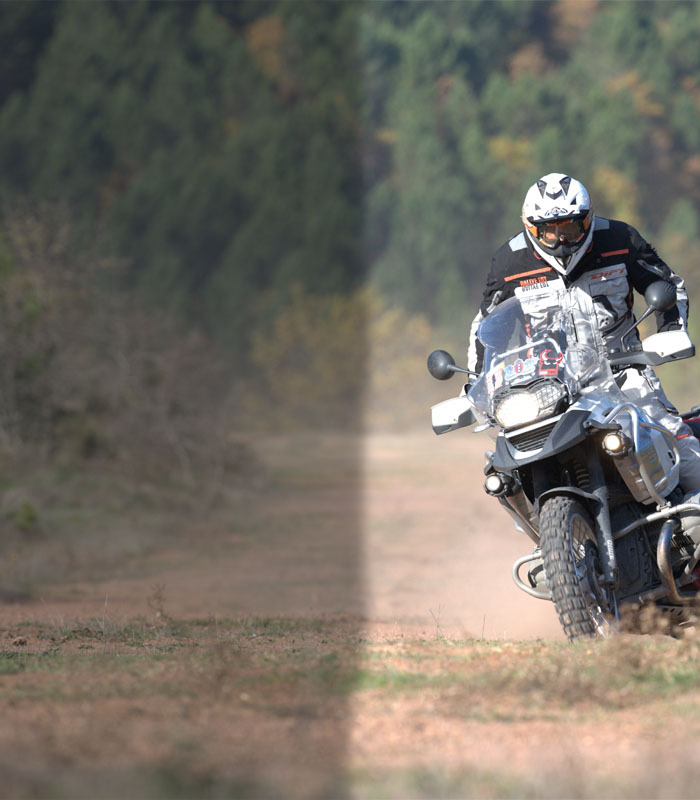 Select Shop by Bike to choose your bike or Shop by Accessory to choose the accessory you are interested in. 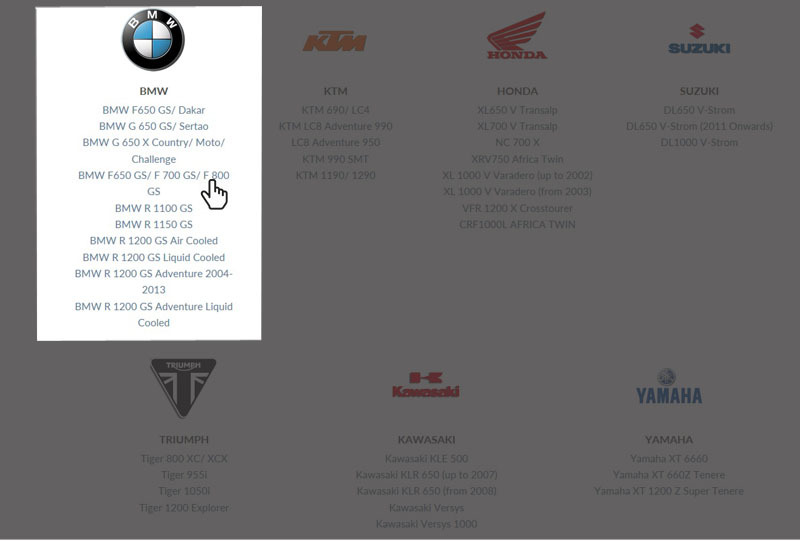 You can also select your bike or accessory directly from the Mega Menu located on the top of each page. 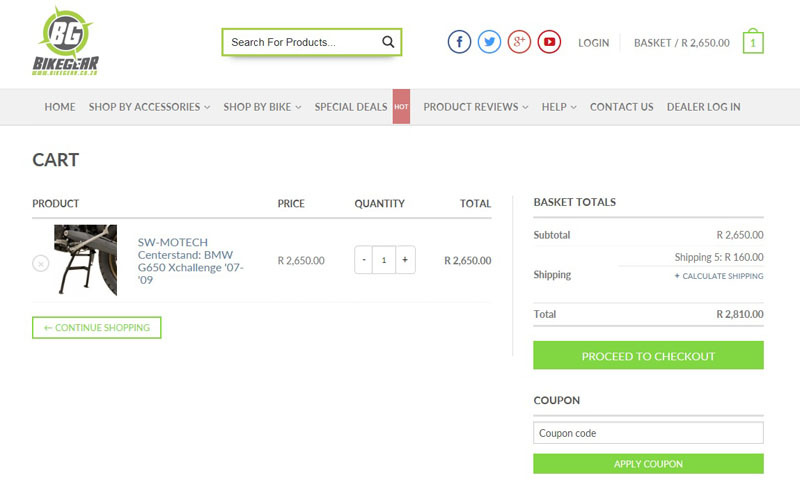 Within the Shop by Bike page, search for your bike and click on the name of your bike. On the Shop by Accessory page, you’ll find the product categories, click on the category you are interested in and you will find the products on offer. Once your selection is shown you can either click on the name of the product to read more on that product or click on Add to Basket to instantly place the item in your basket ready for checkout. When you have added all the items you need into your basket it’s time to checkout. Hover your mouse over the basket icon in the top right corner and your basket contents will pop up along with your subtotal (minus courier charges). From here you can click on view cart to view and edit the contents of your cart or you can click on checkout to go straight to the checkout process. 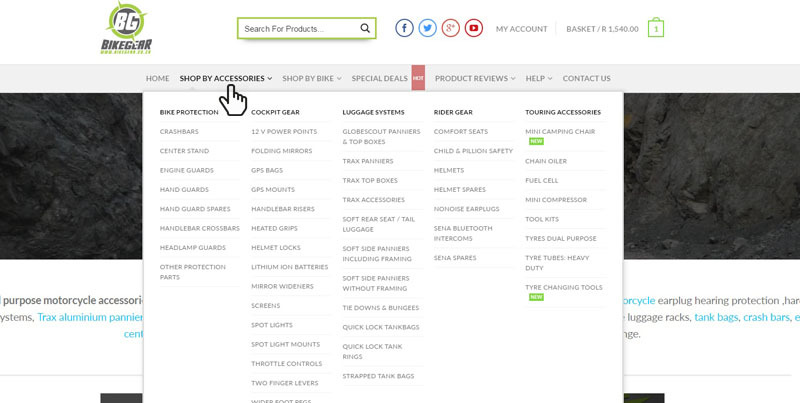 In the View Cart section, you will be able to view and edit the contents of your basket. 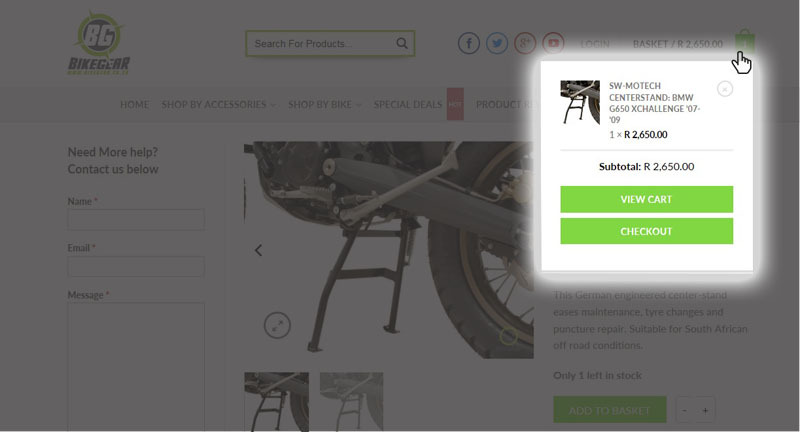 Here you will be able to increase or decrease the amount of a specific item in your cart or remove it completely by clicking on the cross next to the item. When you are ready for checkout click on checkout by clicking on either the top right corner basket icon or on the View Cart page. 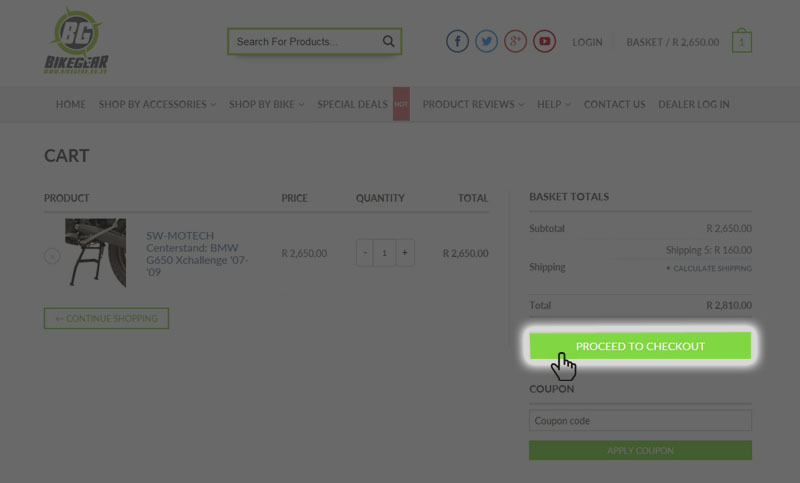 You can go directly to checkout by clicking on Checkout under the basket icon in the top right-hand corner of every page. 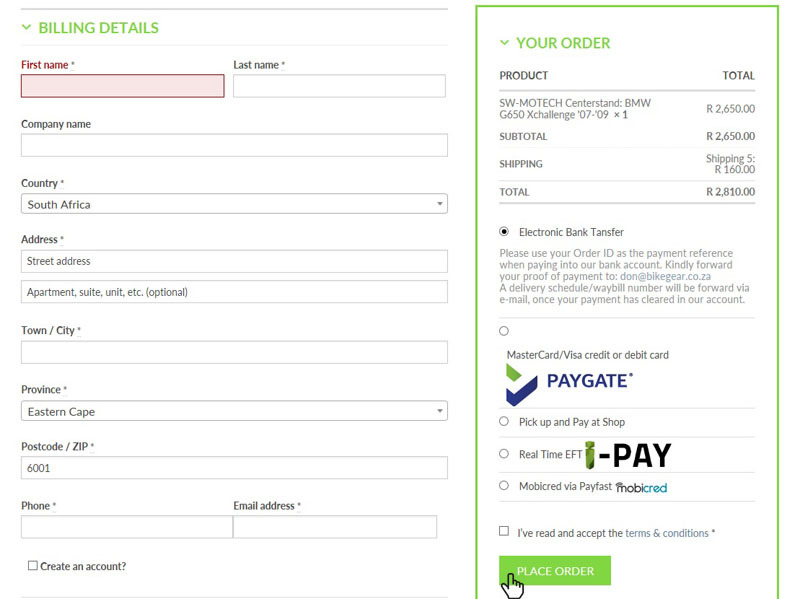 The final step is to fill out your details and choose your payment method on the Checkout page. On this page, you can also add special instructions under the Order Notes section and create an account for easier checkout next time you buy. Choose your payment method. You can read more about our payment methods here. Accept the terms and conditions and click on the Place Order button. Follow the on screen instructions for your chosen payment method to complete the order. Once your order has been placed you will receive a confirmation e-mail from us as well as confirmation from the payment service provider you used. We will update you on every step of the order and finally with your courier details and a tracking number.